One in four college students wants a plant-based eatery on their college campus, according to a food industry survey. Now, students at San Diego State have one with the April opening of an all-vegan restaurant franchise. Plant Power Fast Food serves the local community a plant-based protein diet instead of an animal-based protein diet. Inside the restaurant, students can grab a quick bite made from a proprietary blend of vegetables or an almond milk shake. A student at SDSU with a passion for influencing others to eat healthier and avoid animal products is Voice for Veg President, Steve Soto. He advocated for the opening of a plant-based eatery on campus with his student organization. Voice for Veg is a political organization at SDSU, founded in 2017. It is recognized as a political organization due to their advocacy for farm animal welfare and agricultural subsidies that are dependent on policy. Soto noticed that fellow students were interested in healthy eating. He started an organization to advocate for a plant-based diet, anti-animal cruelty, and sustainability. The organization meets with members of the Humane League on a regular basis. Voice for Veg campus meeting on March 26. (First person closest to the left-side of the monitor is the Humane League Vice President, Grassroots, Jon Camp). 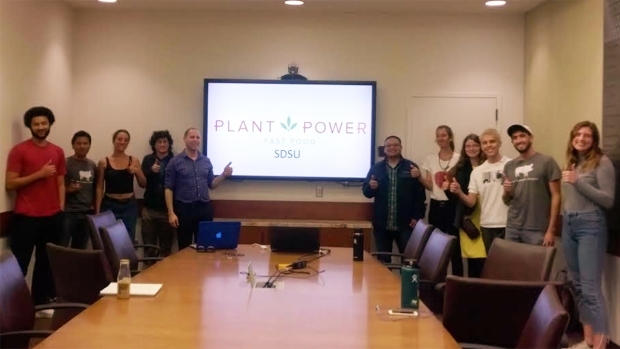 SDSU Dining Services Director, Paul Melchior, worked closely with Voice for Veg and Plant Power owners for the implementation of the restaurant on campus. Melchior believes that the choice of campus eateries should be a conversation with the students, and he reviews student feedback through surveys. According to Melchior, some have requested a vegan destination in past surveys. Melchior mentioned that Plant Power Fast Food will join the other 45 restaurant options on the meal-plan for students. Another upcoming restaurant set to open this year that will tend to students’ dietary needs is Halal Shack, a Mediterranean restaurant. Incoming 2019-2020 San Diego State Associated Students Sustainability Commission Representative, Kelly Renton, thinks that Plant Power will help consumers make the connection that food can taste great while simultaneously being great for the environment. The eatery at 5842 Hardy Ave. produces similar products to other fast food restaurants: burgers, chicken tenders, sandwiches, fries, and shakes. However, they offer cruelty-free, plant-based versions that move sustainability efforts in a positive direction (or that positively impact sustainability efforts), according to Ravi Parikh, owner of the Plant Power franchise at SDSU. 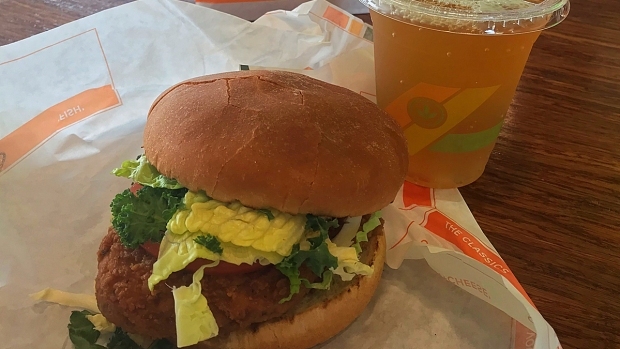 Plant Power Fast Food’s Crispy ‘Chicken’ Sandwich & Kombucha On-Tap at 2204 Sunset Cliffs Blvd. He chose SDSU as a location for this restaurant because of the entrepreneurial spirit he felt on the campus. Plant Power currently has two locations in San Diego, and another in Redlands, Calif. Another location in Long Beach is underway.